The South American champions are back on track on the quest for the main round spot. They defeated Angola 26-33 and now have three points on group D in Copenhagen. 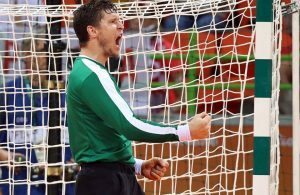 A victory against Qatar tomorrow could book them tickets for Herning, however, they will have to keep an eye on some other results as well. While Argentina was carrying one point from the draw on the opener against Hungary, Angola were above in the table with two points collected after the triumph over Qatar. After a very tight beginning in which the teams took turns to take the lead, they were 5-5 after 11 minutes. Argentina found the goal mostly through connections with the line player and wings, while the coached by Filipe Cruz were relying on their long-range shooting from Hebo and Pestana. By the 14th minute Argentina had created a 2-goal gap that broadened to 4 through 2 consecutive fast breaks to lead 6-10 and force Cruz to call for Angola’s first timeout. The African team caught up by at 22’ but suffered two consecutive two-minute suspensions that helped Argentina regain the advantage. 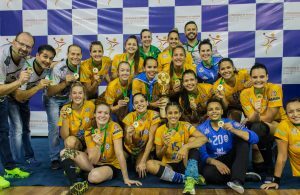 With only a minute left to be played, the South American champions managed to stay ahead, and the first half finished 12-17 in their favor. The first goals of the second period were an exchange of 9-meter throws. 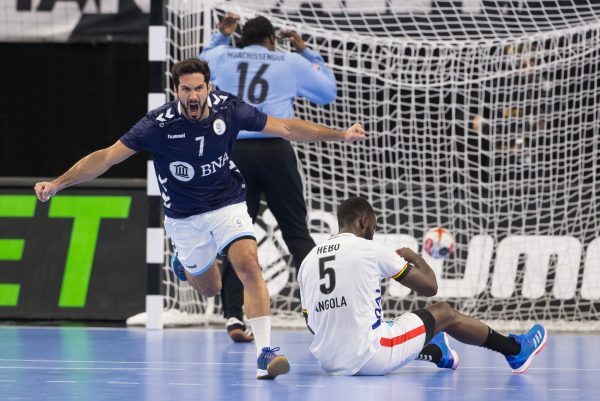 After only 4’ the score was 14-19 with three of the four goals scored being long-range shots from Argentina’s Nicolás Bonanno and Angola’s Edvaldo Ferreira. While Argentina seemed to have taken control of the match after 7 minutes, leading 16-21, Angola slowly caught up. Ferreira continued to score from distance to leave Angola as close as 20-21 after 11’. On Argentina’s goal, Leonel Maciel made his entrance, giving Manuel Cadenas’ squad a breath of fresh air with some saves that helped them get back on track. With 18’ played, Cruz called Angola’s second timeout after receiving three goals in a row that would put them 21-25 behind. At 22 minutes Adelino Pestana scored for Angola after (?) goalless minutes, but Argentina continued to lead. The fast-paced game proved effective and patience paid off as they played until the passive played was called on nearly every attack. With 6 minutes left on the clock, Maciel saved another penalty shot and the South Americans were now leading 25-30. The goalkeeper would close the match with an impressive 46% of saves (6/13). In the end, Argentina stood their ground and took their first victory of the tournament by 26-33. Argentina’s left back Nicolás Bonanno (6 goals) was named best player of the match, but the top scorers were Pablo Simonet and Edvaldo Ferreira with 7 each. After this match, both teams have mathematical chances to move to the main round. With the absence of left wing Federico Fernández, who saw a blue card against Egypt, Ignacio Pizarro took the responsibility and responded well, scoring a total of 5 goals on the match and improved his performance from the previous matches. “I felt really good and I thank out coaching staff because of the trust and confidence they invested in me, even through I didn’t perform so well on the previous three matches. I knew I would have more minutes and that this was a chance to do better and to redeem myself”. Pizarro, one of the seven debutants in a World Championship for Argentina, pointed out the key for today’s triumph: “The most positive aspect of today’s match was that we never gave up, mentally, knowing that we had two finals ahead of us. The fact that we didn’t fall mentally was key because we know the importance of these remaining matches to go through to the main round”. And he continued: “Now we have to recover, be focused for tomorrow’s match against Qatar, continue to watch the videos to analyze them and see what their weak points are. We’ll get o the hotel and watch Hungary’s match as well to see what happens there”. ← Previous Story GO FOR 5TH GOLD: Nikola Karabatic to replace Cedric Sorhaindo!